California’s complex water management system often defies comprehensive analysis. We summarize the results of a decade of quantification and analysis of this system from a hydro-economic perspective using the CALVIN Model. The general approach taken dates back to Roman times, when Frontinus (97 AD) began his oversight of Rome’s water system with a systematic inventory and quantification of its water infrastructure. This approach has been formalized and expanded in the modern era as economists, planners, and engineers have sought to grapple with complex water management systems and problems. In California water supply and demand is inconvenient in both space and time. 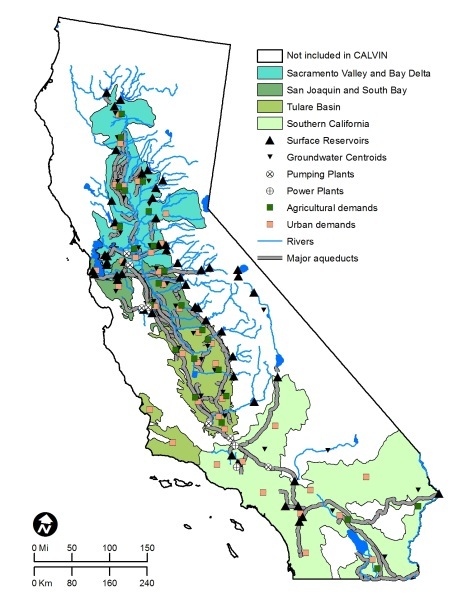 Most water availability is in northern California from winter precipitation and spring snow-melt; whereas water demands are more in the south during the dry summer. Major floods and seasonal and multiyear droughts further complicate water resource management in California. The Sacramento-San Joaquin Delta is the major north-south hub for this water network. Population growth, climate change, a vulnerable Delta, and decentralized water governance pose opportunities and challenges to water management in California. Portfolios of water management activities, including diverse general policy tools, demand management, and operations and supply expansion options, are available to manage competing demands in complex situations. Exploring promising portfolios of actions is the main intent of the CALVIN model. The CALVIN model is an economic-engineering optimization model of California developed at the University of California – Davis. CALVIN’s major innovations are its statewide (rather than project) scale, representation of a broad range of water management options, explicit integration of broad economic objectives, and its consequent applicability to a wide variety of policy, operations, and planning problems.